Chris Sargent got the guys on his candlepin bowling team together in a group just before the third and final string at Metro Bowl Lanes in Peabody on Friday night. He said everyone needed to pick it up a notch or two. "Coach" Sargent, who shot a respectable 130 and 135 in his first two strings that night, heeded his own advice. The 40-year-old Haverhill resident and Groveland police officer ended up having one of the greatest strings in candlepin bowling history. Sargent rolled a 245, tying a world record set in 1984 by Ralph Semb, who also happens to be the current president of International Candlepin Bowling Association (ICBA). Previous to that, Sargent's best-ever string was 214. "We were losing this match by 51 pins," recalled Sargent, whose average is about 125. "The league ends (this week). We're in first place, but the second place team is close to us in overall points. Each person on the winning team gets about $1,200 and each person the second place team gets about $700. That's a big difference." Sargent opened his string with an easy spare followed by a strike, before he sat down for a rest. Then he rolled two more strikes, before taking another breather. "My teammates were going a little crazy, giving me high fives after that fifth strike in a row," said Sargent, who is married and a father of four children. "I was definitely in a little zone and feeling good." Then it was two more strikes, both of which sent the pins down without any doubt, that the opposing team started to get excited. "That was an awesome feeling, when the other team started going a little crazy, rooting me on," Sargent said. Sargent stayed hot, getting a strike in his next frame before a spare — "It wasn't even close to a strike. I got seven pins," said Sargent — finally piqued his interest in his score. "I usually don't like looking up at the scores, other than to check where we stand in the team competition," said Sargent. "But when I saw that I was at 197 and the fill (on the spare) after eight frames, I said, 'Man, I'm over 200 already.'" Sargent wasn't finished wowing people. He scored a strike in the ninth frame, as several bowlers from nearby lanes came over to check out the excitement, including the owners. The 10th frame appeared to be just like the ninth, as his ball was perfectly thrown just to the left of the head pin. But for some reason, one pin, shaking a bit, never fell. He got the spare, setting up his final ball in the extra frame. He needed nine pins for the world record. He got eight to tie it. When he finished everyone at Metro Bowl was cheering. "If that pin fell in the ninth (frame) for a strike I would have been guaranteed in the 250s," said Sargent. "But I can't complain." Sargent's team went on to win six out of a possible eight points (two points for each game and two points for the overall) and beat the opposition by a whopping 158 pins. But on this night, the team was secondary. "It was incredible to watch. I got chills," said Sargent's teammate and friend, Dave Godwin of Methuen. "I've bowled six strikes in a row before. I can't explain how nervous you get after you get four or five in a row. "But Chris is special," he said. "He has a way of staying so calm. He bowled the best string ever. That's incredible when you think about it." Sargent is no stranger to the ICBA world record book. He owns the best three-string total (530) in a five-string match. 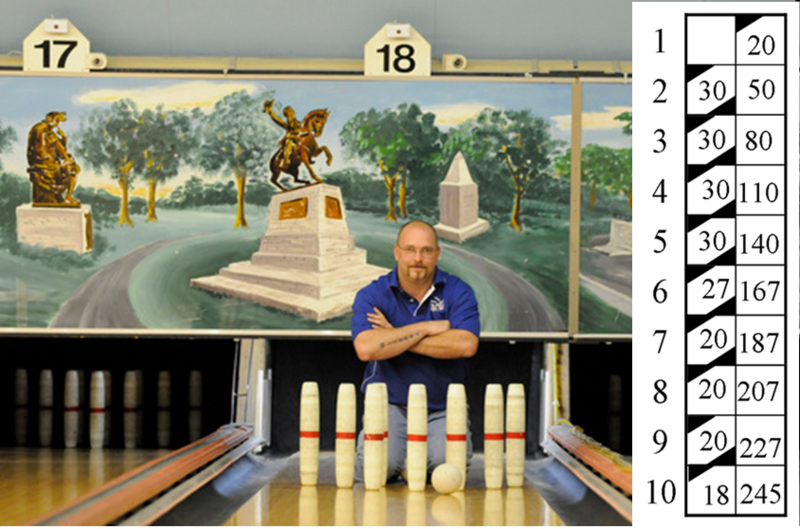 Twice he broke the three-string record, which is 514, but on both occasions — he scored 518 and 517 — they weren't recognized because the facility wasn't sanctioned and the other bowling alley's foul lights weren't activated. Sargent is also part of the reigning 10-man team from USA East that won the world championships last October in Maine. Godwin, Gary Carrington (Plaistow, N.H.) and Chuck Desrochers (Methuen) were other local bowlers on that team. In fact, Chris Sargent isn't the only Sargent in the record book. His father, Mike Sargent, of Bradford, owns the world record for five strings with a total of 840. "The funny thing is I didn't take up bowling competitively until I was older, in my early 20s," said Sargent. "I watched my dad bowl a lot. He was awesome. My thing was hockey. But when I got older I started bowling ... and I haven't stopped." It could be argued that candlepin bowling's version of the 300-game in 10-pin bowling is 200. Chris Sargent would probably agree. Prior to Friday night, he had bowled 200 or higher 12 times. He also had scored 500 or better for three strings 12 times. On Friday night, his three-string total was 510. "I got a call from a friend who said, 'Did you realize that you have scored 200 (or higher) 13 times and you have scored 500 (or higher) for three strings 13 times? And you did it on Friday the 13th!'" said Sargent, of his feat on May 13. "It's pretty crazy when you think about it." In 1984, Ralph Semb, then 38, bowled a phenomenal single game of 245. Commencing with seven consecutive strikes and finishing with three spares. Semb's score seemed destined for the record books. Unfortunately, because the site of the 245, Community Lanes in Westfield, Massachusetts, was not at the time a dues paying MBA member, the sanctioning of the string as an official has been in abeyance until now. At the time of the event, it was determined that the lanes met proper specifications to allow for the score's sanctioning; nonetheless, bureaucracy prevailed for 15 years and the score was not officially recognized until the MBA and ICBA elected to so recognize it in 1999. Semb hit the score in the Western New England Pro Tour. The ICBA will recognize only scores bowled that conforms to the ICBA rules and lane and equipments specifications and all other rule requirements. All aspects of these events will have the opportunity for a bowler and or bowlers to break and ICBA record. Record scores must be bowled on sanctioned lanes and in conformance with all rules and regulations of the ICBA. Record score must have been bowled under controlled conditions: League Play, Published Tournaments, all aspects of TV Roll-offs and State and Provincial Events. All aspects of pro or amateur tours. Controlled conditions being defined as League Play, Published Tournaments, TV Roll-offs, TV Semi Finals, Finals, TV Taping, State and Provincial Tournaments and State and Provincial Tournament Finals, Pro and Amateur Tours. All aspects of these events will have the opportunity for a bowler and/or bowlers to break the ICBA record. An approved and working automatic foul detection devise or a competent foul line judge (one for each eight lanes) must have been employed during the full time the score was being bowled. Approved balls, pins and pinsetters must have been used. Once the proposed record is scored, balls and pins used must be immediately held by the center proprietor. In more than a three string event, consecutive strings must be used, beginning with the first string. For example – A bowler cannot use the second, third and fourth string for the three string record, etc. At least one week advance publicity must be given of the event if other than regular league play. There must be at least four bowlers in a regular, publicized shift, two bowlers per lane.In a finals or elimination event whereas there will be less than four bowlers because of a established format. These bowlers are eligible for records. No handicapped scores will be recognized. ​Notification of a record breaking score must be made to the President or Executive Manager of the appropriate state, provincial or local association within 24 hours from the time of the proposed record was bowled. The President or Executive manager of the appropriate state provincial or local association must immediately within 24 hours call their lane inspector. The lane inspector must, within 72 hours from the time the proposed record score was bowled, inspect the lane (s), pins, balls and pin setters used by the bowlers to be sure all lanes and equipment conform to the ICBA standards and specifications. For any reason the local lane inspector is unable to inspect the lanes and equipment in the allocated time arrangements need to be made to call an alternative ICBA inspector for inspection of lanes and equipment. The appropriate state, provincial or local associations shall at the next regularly scheduled or special meeting called to vote on recognition of the new score as a state provincial or local association record. Following approval of the record by the state provincial or local association, all scores submitted to the ICBA for record approval shall come before the Board of Directors at the next Board of Director meeting for approval as an ICBA record. Awards presented to a bowler and/or bowlers will be decided by committee.